How Affordable is Property for Aylesbury’s Average Working Families? The simple fact is we are not building enough properties. If the supply of new properties is limited and demand continues to soar with heightened divorce rates, i.e. one household becoming two, people living longer and continued immigration, this means the values of those existing properties continues to remain high and out of reach for a lot of people, especially the blue collar working families of Aylesbury. Looking at some recent statistics released by the Government, the ratio of the lower quartile house prices to lower quartile gross annual salaries in Aylesbury Vale District Council has hit 11.96 to 1. What does that mean exactly and why does it matter to Aylesbury landlords and homeowners? 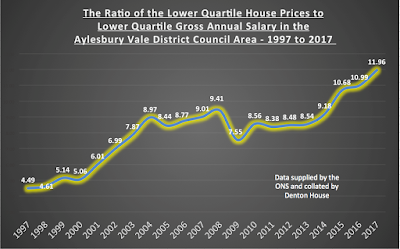 If we ordered every property in the Aylesbury Vale District Council area by the value of those properties, the average value of the lower quartile properties (i.e. lowest 25%) would be £250,000. If we then did the same, and ordered everyone’s salary in the same council area, the average of the lowest quartile (lowest 25%), the average salary of the lowest 25% is £20,901 pa, dividing one with the other, we get the ratio of 11.96 to 1. Assuming there is one wage earner in the house, the chances of a Aylesbury working family being able to afford to buy their own home, when it’s just under twelve times their annual salary, is very slim indeed. The existing affordability crisis of people wanting to buy their own home is the unavoidable outcome of the decade on decade failure to build enough homes to keep up with demand. Nevertheless, improving affordability is not a case of just constructing more homes. Aylesbury Vale District Council needs to ensure more properties are not only built, but built in the right locations and of the right type and at the right price to ensure the needs of these lower income working families are met, because at the moment, they presently have few options apart from the private rental sector. Looking at the historic nature of the ratio, it can clearly be seen in the graph below that this has been an issue since the early to mid 2000’s. However, if we look at the historic data, those on the bottom rung of the ladder (those in the lower quartile of wage earners) used to be housed by the local authority instead of buying. However, the vast majority of council houses were sold off in the 1980’s, meaning there are much fewer council houses today to house this generation. Many of the lower quartile working class families were given a lifeline to buy their own homes in middle 2000’s, with 100% mortgages, but the with the credit crunch in 2009, that rug (of 100% mortgages) was rudely pulled from under their feet. You see it is cheaper to buy than rent ... it’s the finding of the 5% deposit that is the challenging issue for these Aylesbury working class families. So unless the Government allow 100% mortgages back, the fact is, demand for rental properties will outstrip supply. 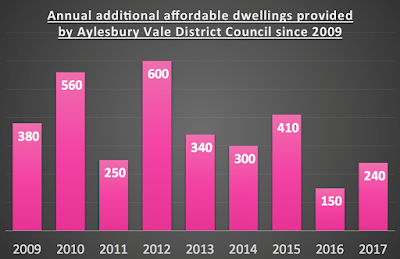 In the long term, to alleviate that, I would suggest the Aylesbury community hold their local politicians and Aylesbury Vale District Council to account for the actions they could take to ensure the affordability of housing and the extent to which they work with private developers and housing associations and aggressively use the planning tools at their disposal to safeguard the local community getting the new households we need. Aylesbury Vale District Council could make certain parcels of residential building land for private rented development only, eliminating the opportunity of the land being bought to develop large executive homes, which do not solve the current problem. Yet in the short term, all this means is demand for rental properties will continue to grow, keeping Aylesbury house prices high and Aylesbury rents high. A noteworthy number of buy to let landlords in Britain plan to buy more properties over the next year notwithstanding the frustrations, challenges and seismic changes in the private rented sector. According to Aldermore, the specialist Buy To Let lender, their research shows around 41% of portfolio buy to let landlord’s objective is to grow their buy to let portfolio (i.e. Portfolio landlords are landlords that own more than one property). So, I thought, “Are Aylesbury landlords feeling the same?” If so, if these numbers were applied to the Aylesbury private rental market, what sort effect would it have on the Aylesbury property market as whole? Talking to the landlords I deal with, most are feeling quite optimistic about the future of the Aylesbury rental market and the prospect it presents notwithstanding the doom and gloom prophecies that the property market will shrink. Many of those Aylesbury landlords who are looking to enlarge their portfolio are doing so because they still see the Aylesbury rental market as a decent investment opportunity. With top of the range Bank and Building Society Savings Accounts only reaching 1.5% a year, the rollercoaster ride of Crypto currency and the yo-yoing of the Stock Market, the simple fact is, with rental yields in Aylesbury far outstripping current savings rates, the short term prospect of a minor drop in property prices isn’t putting off Aylesbury landlords. The art to buying a Aylesbury buy to let investment is to buy the profit on the purchase price, not the anticipation of the future sale price. No matter what the historical economy has thrown at us, with the global meltdown in 2008/9, dotcom crash of 2000, ERM in 1992, the three day week, oil crisis and hyperinflation in the 1970’s (the list goes on) ... the housing market has always bounced back stronger in the long term. That’s the point ... long term. Investing in buy to let is a long-term strategy. The simple fact is, over the long term with the increasing demand for rental properties, predominantly among Millennials as many cannot afford to get on the property ladder, and with councils not building enough properties of any kind, many youngsters are having to resort the private rental market for their accommodation needs. So, what of the numbers involved in Aylesbury? There are 844 landlords that own just one buy to let (BTL) property in Aylesbury and 1,838 Aylesbury landlords, who are portfolio landlords (i.e. they own one or more buy to let properties). 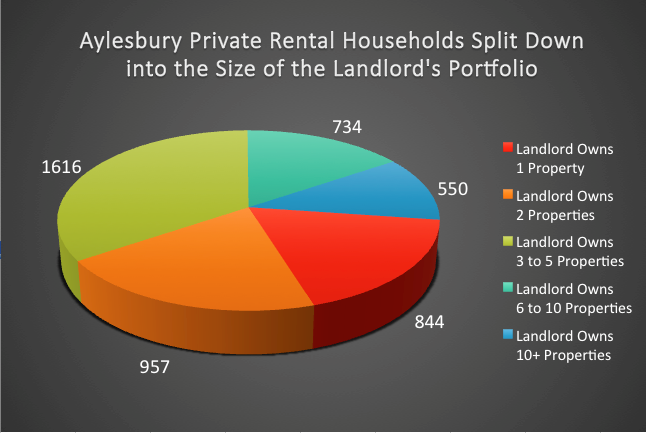 Between those 1,838 Aylesbury portfolio BTL landlords, they own a total of 3,858 Aylesbury BTL properties and they can be split down into the size of landlord portfolio in the graph below…. If I apply the Aldermore figures that means 754 Aylesbury landlords have plans to expand their BTL portfolio in the coming year or so. I would say there is no repudiating that the buy to let market has taken a bit of a beating, thanks to a plethora of Government regulation, new mortgage underwriting rules in 2014 and George Osborne’s tax changes. Yet there still remains an overall consciousness of optimism among the vast majority of Aylesbury buy to let landlords. Despite these latest changes, many landlords still view buy to let as a good investment, as long as you buy right and expand your portfolio taking into account the second rule of buy to let … assess your position on the ‘buy to let seesaw’ of capital growth and yield. If you want to buy right and assess your own portfolio on the yield/capital growth seesaw ... drop me a note. Whether you are landlord of mine or not as the case may be, advice is given freely, without obligation or cost. In my blog about the Aylesbury Property Market I mostly only talk about two of the three main sectors of the local property market, the ‘private rented sector’ and the ‘owner occupier sector’. However, as I often stress when talking to my clients, one cannot forget the third sector, that being the ‘social housing sector’ (or council housing as some people call it). In previous articles, I have spoken at length about the crisis in supply of property in Aylesbury (i.e. not enough property is being built), but in this article I want to talk about the other crisis – that of affordability. It is not just about the pure number of houses being built but also the equilibrium of tenure (ownership vs rented) and therein, the affordability of housing, which needs to be considered carefully for an efficient and effectual housing market. 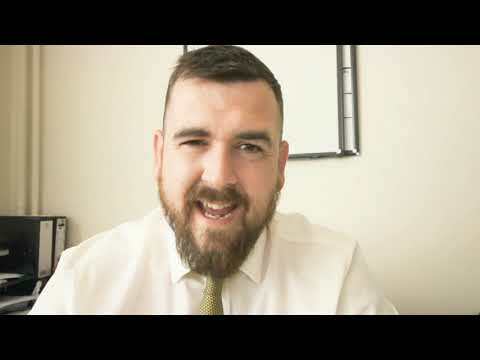 An efficient and effectual housing market is in everyone’s interests, including Aylesbury homeowners and Aylesbury landlords, so let me explain .. The requirement for the provision of subsidised housing has been recognised since Victorian times. Even though private rents have not kept up with inflation since 2005 (meaning tenants are better off) it’s still a fact there are substantial numbers of low-income households in Aylesbury devoid of the money to allow them a decent standard of housing. Usually, property in the social housing sector has had rents set at around half the going market rate and affordable shared home ownership has been the main source of new affordable housing yet, irrespective of the tenure, the local authority is simply not coming up with the numbers required. If the local authority isn’t building or finding these affordable homes, these Aylesbury tenants still need housing, and some tenants at the lower end of the market are falling foul of rogue landlords. Not good news for tenants and the vast majority of law abiding and decent Aylesbury landlords who are tarnished by the actions of those few rogue landlords, especially as I believe everyone has the right to a safe and decent home. Be it Tory’s, Labour, SNP, Lib Dems, Greens etc, everyone needs to put party politics aside and start building enough homes and ensure that housing is affordable. Even though 2017 was one of the best years for new home building in the last decade (217,000 home built in 2017) overall new home building has been in decline for many years from the heady days of the early 1970s, when an average of 350,000 new homes were being built a year. As you can see from the graph, we simply aren’t building enough ‘affordable’ homes in the area. So, what does this mean for Aylesbury homeowners? Well, an undersupply of affordable homes will artificially keep rents and property prices high. That might sound good in the short term, but a large proportion of my Aylesbury landlords find their children are also priced out of the housing market. 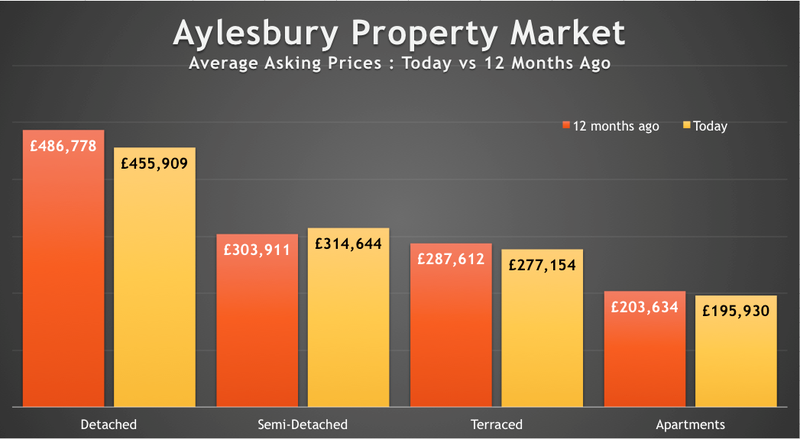 Also, whilst your Aylesbury home might be slightly higher in value, due to this lack of supply of homes at the bottom end of the market, as most people move up the market when they do move, the one you want to buy will be priced even higher. Problems at the lower end of the property market will affect the middle and upper parts. There is no getting away from the fact that the Aylesbury housing market is all interlinked .. it’s not called the Property ‘Ladder’ for nothing! The average asking price of property in Aylesbury increased by 1.5% or £4,422 compared to a year ago, with particularly good demand from landlords and home-movers in the first few months of the year. This takes the current average asking price to £302,133, compared with £297,711 this time last year. The rise in asking prices is being aggravated by buyers jumping into action looking to benefit from potential stamp duty savings (especially first-time buyers) or beat impending mortgage interest rate rises later in 2018. Of the numerous Aylesbury buyers starting their property hunting in the usually active spring market this year, many face paying even more than ever for the property of their dreams, although as I mentioned a few weeks ago, there are more properties for sale in Aylesbury compared to 12 months ago. Interestingly, when one looks at the percentages, the most upward average asking price pressure is in the semi-detached property type sector. Now, I must stress this growth in the asking prices of Aylesbury property doesn’t mean the value of Aylesbury property is going up by the same amount ... nothing could be further from the truth. 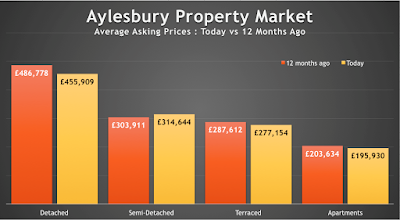 Only time will tell if the current levels of Aylesbury asking prices is a catch-up abnormality after a couple of months of restrained asking price rises in the first few months of 2018, or is it an initial sign that we are in for a better 2018 Aylesbury Property market than all of us were expecting at the start of the year? I believe these asking prices must be viewed with a pinch of salt, as it will be fascinating to see whether Aylesbury properties actually sell at these higher asking prices. Just because house sellers (be they owner-occupiers or landlords liquidating their assets) are asking for more money it doesn’t mean buyers will be enthusiastic to part with their hard earned cash. Like my Mum used to say to me years ago, “You can ask ... but you might not get”. Also, Aylesbury homeowners and landlords wanting to sell their property need to be aware of progressively strained buyer mortgage affordability and the more those sellers increase asking prices, the more buyers will hit their maximum on the amount they are able borrow on a mortgage. However, those Aylesbury buyers who need a mortgage (be they owner-occupier or landlord), will paradoxically benefit from lower mortgage payments before interest rates rise … maybe another reason for the uplift in the number first time buyers and landlords buying? Only time will tell! The rents paid by Aylesbury tenants are now standing at £881 per calendar month (PCM), a rise of 0.65% year on year and 0.75% higher month on month. However, this attention-grabbing monthly rent figure masks stark differences in the various different parts of the Aylesbury rental market. Demand in Aylesbury for high quality family homes with two or three bedrooms in good catchment areas for schools remains really robust due to tenants wanting access to the schools. Other influencing factors that make certain areas popular are the proximity to transport links. However, I have noticed a drop in demand (and thus rents achieved) for property where the landlord hasn’t kept the property fresh; in terms of decoration, carpets, replacement windows and poor heating. So, what does all this mean for Aylesbury landlords and tenants? With the new tax rules for landlords, many believed that the number of rental properties would narrow throughout 2017, as landlords sold up their Buy to let properties and looked to invest their money elsewhere, but evidently this hasn’t happened (yet). Feasibly Aylesbury landlords are re-mortgaging their Aylesbury buy to let properties instead, as they still believe it’s a safer investment than looking, say at the stock market? However, demand remained strong in 2017 for Aylesbury private rental properties, meaning the rents being achieved were at a decent level for landlords. Keeping your outgoings low is also an important consideration and so I looked on a well-known financial services comparison site this morning and found a High Street bank offering a 5-year fixed rate for Buy to let landlords with a 40% deposit/equity for 2.17% … I can remember (as I am sure many of my readers of this blog can) when mortgage rates were at 15% - this is cheap money! 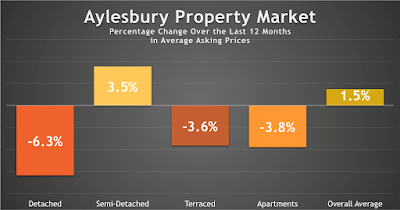 Looking at property values in Aylesbury, over the last 12 months and specifically at the lower of the market where buy to let landlords tend to buy their rental properties. Flats/apartments have fallen in value by 0.15% whilst terraced properties have risen by 0.99%. Some Aylesbury landlords have seen the yields they are achieving remain squeezed. However, most landlords can start to feel assured that as capital growth in Aylesbury remains at a more realistic figure (good for long term stability in the property market) and long-term rents are on the rise, the overall corresponding annual return on investment (Annual ROI being annual capital + annual yield) has stabilised in all areas and is now starting to grow. With additional people seeing renting as a long-term option, even with the challenges of the new tax regime, Aylesbury landlords, with the support of a good advice and opinion, should continue to see renting as a good investment vehicle.